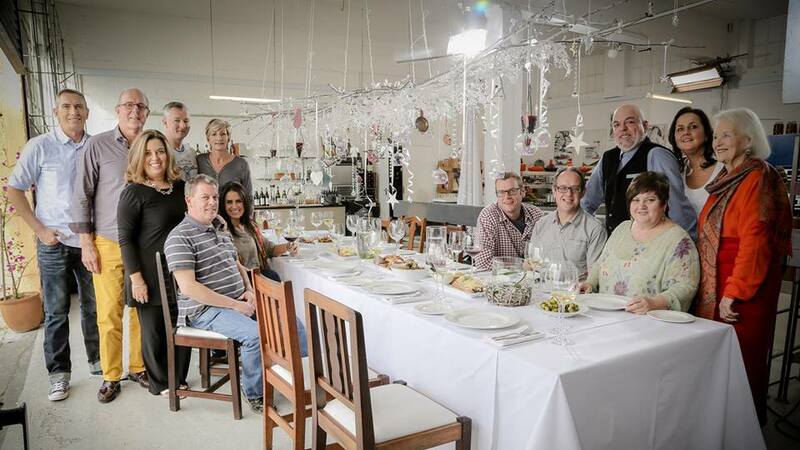 On Thursday evening Chef Pete Goffe-Wood was the first MasterChef SA judge to have an episode in the new M-Net mini-series ‘Feast’ dedicated to him and his cooking, the highlight being the Christmas meal he prepared for his family and friends. Kicking off the episode was Chef Pete shopping for the ingredients for his Christmas feast, which was to be Yellowtail with an orange and fennel salad and tarragon cream dressing; turkey was done on the Weber with stuffing; side dishes of broccoli and potato salad; a cheese board; and Christmas pudding ice cream sundae. Describing the tough life chefs have at this busy time of the year, he said: ‘Chefs don’t often have this time of year off, we’re usually elbows deep in someone else’s turkeys and all sorts of functions. But luckily, I get to do what I love doing the best, the next two days I’m going to be shopping and cooking for those closest to me’. Chef Pete clearly loves Cape Town, clear from his welcome to the show: ‘Hi, I’m Pete Goffe-Wood and welcome to Cape Town – the coolest city on the planet‘. He planned his meal over coffee at Truth on Buitenkant Street. To prepare for the feast, he went to Komati Foods in Observatory to buy mixed peel, nibbed almonds, and dried cranberries for the dessert. He visited The Real Cheese, where he bought Boland, Gorgonzola, Healey cheddar, and Le Petite France camembert. 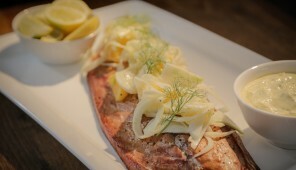 Then he went to Ocean Jewels to buy the smoked yellowtail, which is on the SASSI green list. Once the ingredients were bought, Chef Pete met up with Ian du Toit and Bevan Newton Johnson, two of his former Kitchen Cowboys cooking course students, and they helped him prepare the meal, Bevan making a pineapple salsa, and Ian the garnish for the smoked yellowtail. The food preparation was done at the Kitchen Cowboys industrial kitchen in Woodstock. One long table for 12 guests was set up for the feast here as well, with a white table cloth, and simple but beautiful glass baubles with Christmas items inside them. I recognised Ian and Errieda du Toit, Sophia and Paddy Lindop, Bevan Newton Johnson, and of course Chef Pete and Elize Goffe-Wood. The other guests were Chef Pete’s mom Zhu Zhu, Mitch and Michelle Mitchell, Gerald Heimberg, and Melanie Fanfoni. To fill the gap left on Thursday evenings by 17 episodes of MasterChef SA Season 3, M-Net is flighting a 4-part mini-series ‘Feast’ . 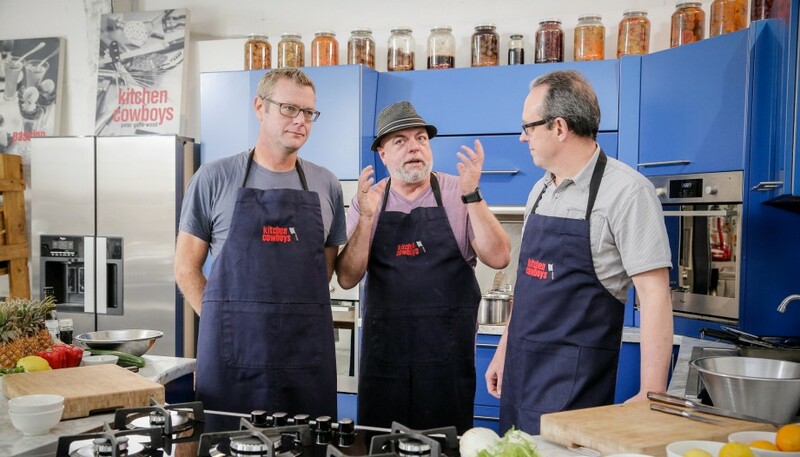 The stars of the episodes are the three MasterChef SA Season 3 judges as well as guest celebrity Chef Marco Pierre White, kicking off with Chef Pete’s episode. ‘December in South Africa is holiday and festive time! Families come together, friends socialise and South Africans around the country are outdoors with loved ones, enjoying the summer sun. The essence of the season is all about celebrating: family and friends, the gloriousness of great food and the opportunity for fun to abound – often around fabulous feasts – and that is what M-Net’s new 4 part mini-series is all about, with one large difference… each episode is hosted by a well-known and much loved celebrity chef! This four-part series will give viewers a look into the personal and professional lives of 4 great chefs – Reuben Riffel, Benny Masekwameng, Pete Goffe-Wood as well as one of the world’s most notorious chefs, Marco Pierre White – as the shows span over the end of December and into January 2015′. Speaking to Chef Reuben Riffel about ‘Feast‘, it appears that none of the four chefs have seen the episodes to be broadcast, not even their own. Chef Reuben’s ‘Feast’ will be broadcast on 1 January, Chef Benny Masekwameng’s on 8 January, and Chef Marco Pierre White’s (with Season 2 finalist Landri van der Wat) on 25 December. POSTSCRIPT 24/12: Some of the recipes for Chef Pete’s dishes are in the Comments section to this blogpost. The full list of recipes is available here. I would like the recipe for the potato salad please. Where can I get this? potatoes into a colander and then put them into a mixing bowl. potatoes will absorb the dressing better. potatoes and season with salt and pepper. otherwise they will cook and wilt. I would like the recipe for the Brussel Sprouts please? Cut the pancetta into a neat dice. the pancetta until it begins to colour and starts to crisp. thoroughly so that the pancetta is evenly distributed throughout the sprouts. pan from the heat and remove the lid. to the sprout. Season to taste with salt and pepper and then serve. Any chance on getting the recipe for the stuffing? I have e-mailed Chef Pete, but fear that he may be on Christmas leave. I will post the stuffing receipe as soon as I receive it from him. I have requested the recipe for you Lydia. I have alerted Chef Pete to your fabulous feedback Alwyn. Thank you for posting it.